World No.1 and Nike golfer Rory McIlroy laid down a challenge for the brand designers to create a solution that provided better traction during his game, and their response was the Nike Lunar Control 3. Offering the ultimate lightweight performance with maximum stability and control, McIlroy and fellow Nike Golf athletes debuted the new Nike Lunar Control 3 at the DP World Tour Championship in Dubai, and noticed a definite boost in play. Due to the rotating force in his swing, McIlroy wanted a solution that would provide him with greater traction which also prevented slipping. But he also wanted the shoes to retain that same control necessary to generate power and speed on the golf course. Nike designers tackled these issues by adding an extra spike on the newer model in the medial forefoot on the outsole, and secondary traction elements in the Nike Lunar Control 3. 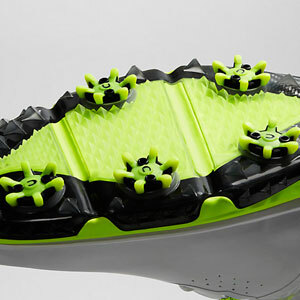 The shoes also feature a wider base for increased stability and to help players maintain contact with the turf for as long as possible through impact. This is coupled with a carbon fibre midfoot shank which delivers lower, lighter and far more stable control on every shot. Similar to the Lunar Control II shoes, the upper of the Nike Lunar Control 3 utilises the excellent Nike Flywire technology – an adaptive lateral support which uses more robust cables to help secure the foot effectively. The shoe’s upper is made from microfiber synthetic to give incredible water-resistance. Play in a thunderstorm and feet will remain dry, warm and protected, just as they would if worn in snow or other adverse weather conditions. Nike even say these shoes are so comfortable that they fit perfectly right out of the box. When it comes to the midsole, Nike Lunar Control 3 shoes feature a lighter and softer full-length Nike Lunarlon foam to give lightweight responsive cushioning underfoot – an invaluable tool for any athlete on their feet for extended periods of time. The Nike Golf Lunar Control 3 Golf Shoe will be arriving soon at american golf. View the full Nike Golf range of equipment, clothing, shoes, bags and accessories now.